Liquid-Plumr and Drano contain caustic ingredients that eat away at your pipes and irritate your lungs. They’re also terrible for the environment. The chemical smell drifting from your drain is a dead giveaway that tells your plumber you’ve been using these products. 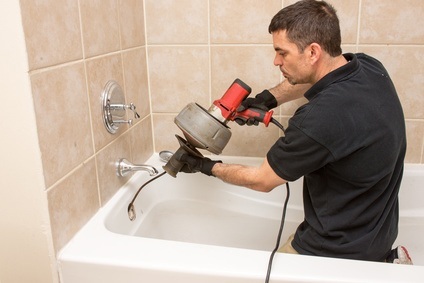 So, what’s the solution when Drano just doesn’t do the trick for clearing your clogged drain? The most effective and long term solution for unclogging drains and pipes is snaking. This physically breaks up the clog and gets the water to properly flow through. A plumber's snake is a slender, flexible auger used to dislodge clogs in plumbing. The plumber's snake is often reserved for difficult clogs that cannot be loosened with a plunger. It is also sometimes called a toilet jack. The most powerful form of snaking is performed by a drum auger. A drum auger is a motorized auger with modular blades designed for various gauges of pipe. A drum auger is powerful enough to cut through tree roots. Used unskillfully, they can also damage plastic pipework and even copper tubing. Plumbing snakes with the capacity of a drum auger should always be left in the hands of a professional plumber. Please contact Kost Plumbing today for all your plumbing needs!